for intermediate/advanced Japanese language learners, for English language learners whose native language is Japanese. Touching English words, app displays Japanese meaning of the words and idioms as they match. 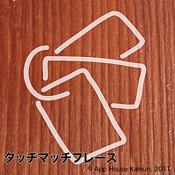 ✐Touch Match app can load eBook, web, text documents displaying Japanese meaning of words/phrases by single touch. Good for translating documents into Japanese. ✐Text mode allows text edit, making use of Japanese word lookup. ✐In addition to dictionaries on the Internet, your own dictionary, free dictionaries, commercially available dictionaries generated by PDIC software on PC can be imported via iTunes file exchange. For details, refer to our support page. ☛Touch Match app can load web documents, text documents and ePub eBooks. However, availability of dictionary look up function depends on its format. ☛The direction of looking-up meaning is English-to-Japanese only. Some of vulgar or nasty words/meanings are blocked so they are not displayed. ☛"PDIC" is a PC shareware with open dictionary format, for user to display, create, maintain dictionary and convert them between various dictionary formats.